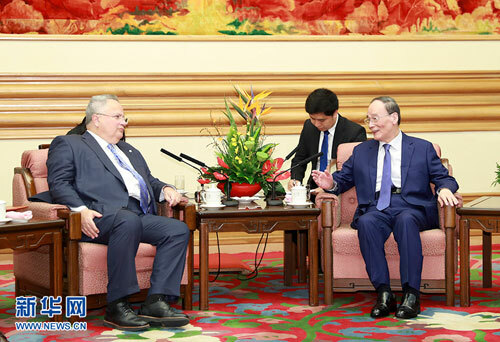 On August 28, 2018, Vice President Wang Qishan met at Zhongnanhai with Foreign Minister Nikos Kotzias of Greece. Wang Qishan said that both China and Greece are ancient civilizations with a long history and splendid culture. The two sides enjoy a traditional friendship, with deep feelings between the two peoples, close high-level exchanges and solid political mutual trust. The Chinese side is willing to, together with the Greek side, take the consensus of the leaders of the two countries as the guidance, and deepen mutual understanding at all levels and in various fields to constantly consolidate the foundation of mutual trust of China-Greece comprehensive strategic partnership; both sides should strengthen the integration of development strategies to promote the construction of the Belt and Road Initiative; both sides should enhance coordination and cooperation in major international and regional affairs to jointly address global challenges; both sides should promote the healthy and stable development of China-European Union relations to make new contributions to building a new type of international relations and building a community with a shared future for mankind. Nikos Kotzias expressed that Greece is a sincere partner of China. Greece-China relations are of strategic significance. The Greek side is willing to, together with the Chinese side, deepen practical cooperation in various fields, cement mutual leaning between both civilizations, give play to the advantages of respective culture and promote peace and development for mankind.